The proclamation was actually done in the spacious yard of Sukarno’s residence, which is why it is presently called Proclamation Building Yard Compound. On the site, the Proclamation Monument was built to commemorate the event. It has two statues on either side. 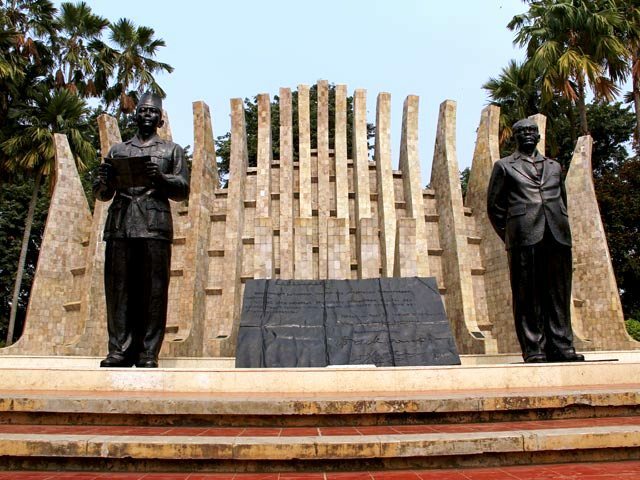 If you are facing the monument, the statue on the left side is that of President Sukarno, which stands at 4.6 meters and weighs 1,200 kilogram. On the right side is the statue of Mohammad Hatta, fhe first vice president, which measures 4.4 meters tall. At the back of Sukarno and Hatta’s statues, there are 17 pillars signifying the date of proclamation. This monument was inaugurated on August 16, 1980 by President Suharto, who succeeded President Sukarno. Near the monument stands Tugu Petir, also known as Thunderbolt Monument, which marks the actual place where President Sukarno read the text. Many people are wondering where the actual Proclamation Building now stands. The original plan of President Sukarno was to declare the proclamation of independence at Ikada Plain, an open field in central Jakarta. However, because of controversies surrounding the event and for fear of being sabotaged by the Japanese, the event took place in his own house instead. Thus, based on history, his residence is the actual site where Indonesia was declared independent. Unfortunately, the house was already destroyed back in the 1960s. President Sukarno himself initiated the dismantling of the building in spite of protests and even suggestions to turn it into a museum because of its historical value. Some people say the first Indonesian president decided to destroy the old house because he did not want to be reminded of certain unfortunate events that took place in it during his reign. In place of the actual building, President Sukarno had a miniature model of the house built using photographs and mockups. The miniature Proclamation Building was designed to look exactly like the old building. It was put on display in City Hall. The old house of President Sukarno is not the only historical building that has suffered from destruction. Other historical sites that no longer exist include the building where the young people met together in 1945 to prepare for independence and defend the area if necessary, and the headquarters of the BKR or The People’s Security Organization. Although the original Proclamation Building has been long gone, the people of Indonesia have not forgotten the importance of the events that led to their freedom. The Proclamation Monument and the Tugu Petir are living reminders of the significant turning point in Indonesian history.